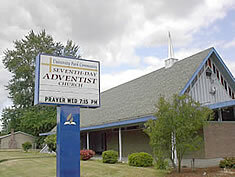 Welcome to the University Park Adventist Church here in North Portland, Oregon. We invite you to come fellowship and worship with us. We have both English and Spanish Christian Sabbath School and worship services for you to attend. We would love to meet you in person and share God's love with you. Our mission is to bring the love of Jesus to everyone in our community. Sabbath starts Friday 8:02 p.m.
Sabbath ends Saturday 8:04 p.m.
April 20, 2019 - Join Us! Worship is held every Saturday. God notices when a sparrow falls, how much more important and valuable are you than a sparrow. Turn your eyes on Jesus and the things of this world will grow small, as you look to Jesus the best friend you can trust. © 2019 University Park SDA Church. All Rights Reserved.